Deep colour, solid bouquet, spicy on the palate. 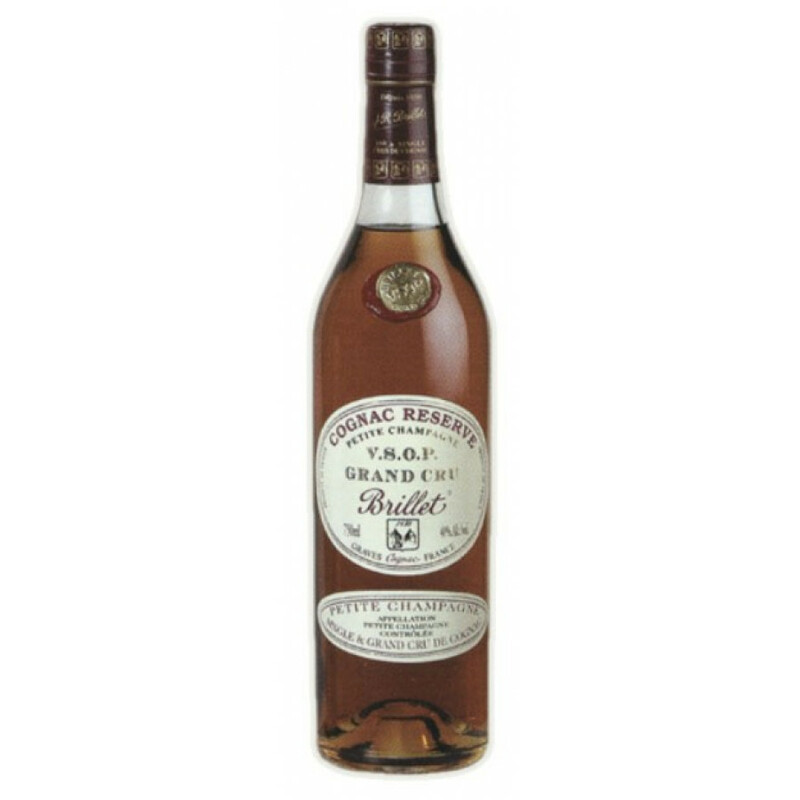 Cognac Brillet Réserve Extra is a 40% ABV Cognac from the Petite Champagne growing region. Also known as "Brillet Grand Cru", this is a great staple cognac to have in your cabinet. Un-blended exclusively from Grand Cru Petite Champagne Vineyards and aged for 6 years in oak, this Cognac captures the natural essence of the Petite Champagne terroir: complex with a nose that suggests honey, lavender, crushed dried spices, vanilla, hazelnut and buttered brioche with a long elegant finish. As will all of Brillet's cognacs, it's hand-crafted in the family distillery in Les Aireaux, a small hamlet near Jarnac in Cognac. "Several layers of aromas...pears to soft old oak to citrus peel. The palate is sleek and mildly sweet in a fruity way. Mid-palate ripe red fruit, buttery oak and firm spirit. This VSOP makes you wonder why to spend more money on a XO. Proud of its family tradition, Brillet Cognac insists that the history is entirely linked to that of cognac. As early on as 1656, Guy Brillet installed his first alembic (the classic still) at his property in the Grande Champagne. This was the introduction of the double distillation process that creates cognac to this day. The Brillets live off their philosophy that things made with care are more valuable, sticking to traditional techniques of production and packaging. Their motto is not to impress through high maintenance or expensive containers, but rather through a humble and high quality aesthetic: a real family business! Strong rancio notes, some vanilla on the palate, flowers on the nose - long and persistent finish. A high degree of rancio, naturally. Tasting review by Leyrat Cognac: Old gold color. A dense initial nose displays dried hay and a touch of spice. It develops to more pronounced oak with traces of pears and pepper. The palate is smooth and rich, with an aftertaste of oak and flowers, violets in particular. Tasting review: Eye: Golden amber Nose: Earthy, with tones of grapes, soft fruits, honey, and cream Palate: Deliciously creamy in the mouth, elegent and light, slightly sweet.